It is revealed here that Tolliver is actually Cable's son Tyler, who assumed the identity of Tolliver (and carried out various actions, like kidnapping Domino and replacing her with Vanesa) in an effort to get revenge on his father for sacrificing him to Stryfe. Askani, the woman who brought Cyclop's son into the future in X-Factor #68 "returns" this issue, though it's made clear this is a different woman, the idea being that "Askani" is a group in which the members forsake all other names (so everyone is "Askani"). 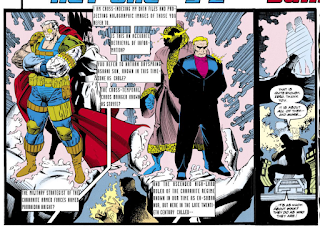 It's also made clear here that this Askani is a temporal projection and isn't physically "there". What will come to be known as the Askani Clan was founded/is led by an elderly woman known as Mother Askani, appearing here for the first time. 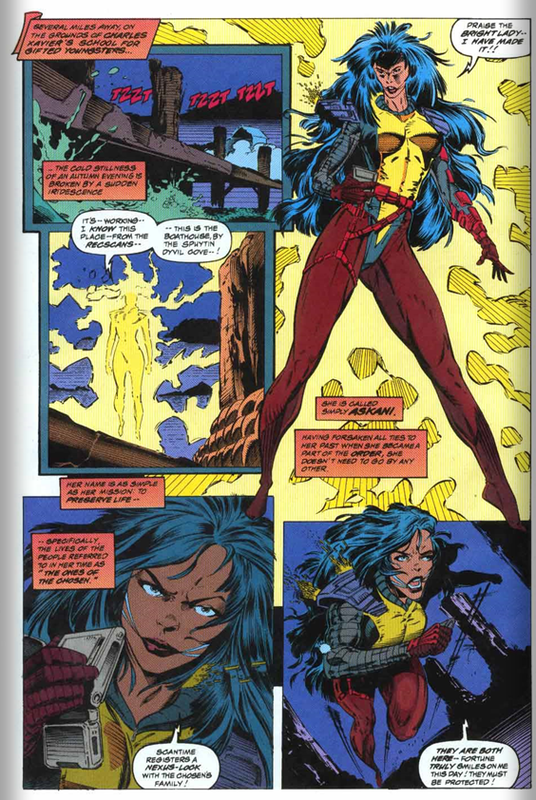 She will eventually be revealed to be a time-lost Rachel Summers, living out her older years in the far future, overseeing the care and raising of her quasi-brother. It's also suggested that the "Bright Lady" Cable occasionally swears an oath to. 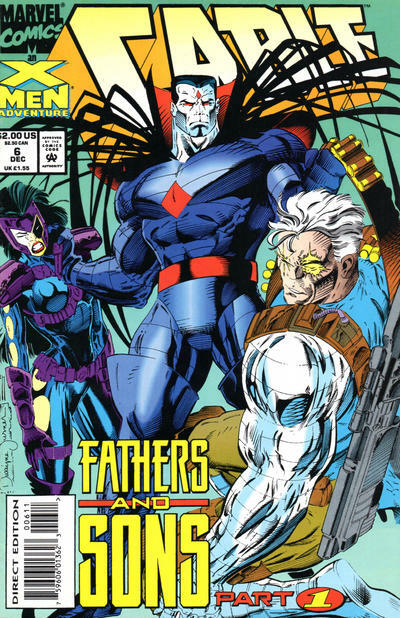 Mr. Sinister, continuing his tour of popping up to make cryptic comments to various X-character, appears in this issue, the first time Cable and the man who ostensibly arranged his birth meet face-to-face. 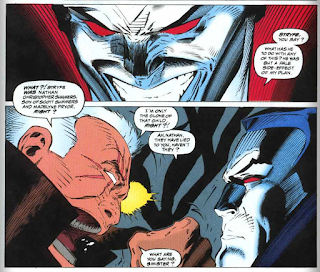 Sinister suggests that he sought the creation of Cable to be a savior, which marks the beginning of the larger idea that Mr. Sinister orchestrated the birth of Cyclop's son in order to use him as a weapon against Apocalypse (something that will be reinforced by "Age of Apocalypse" and X-Man's subsequent arrival in the main reality), which in turns leads to the larger idea that Cable is chiefly concerned with defeating Apocalypse and it is to that end that he initially traveled back in time in the first place (thus retconning out most of the "Cannonball is a High Lord and that's why he came back" business). 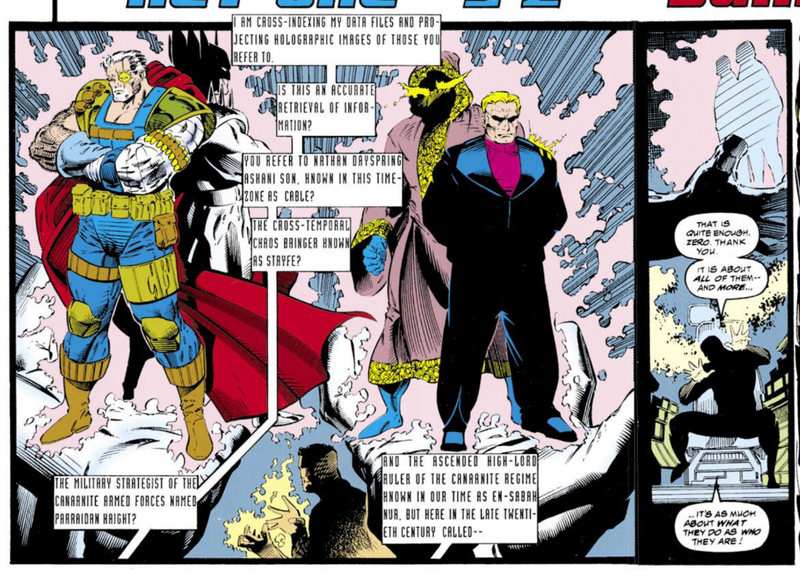 Sinister also hints at the larger revelation that comes in this story, suggesting Cable was lied to about Stryfe being the original Nathan Summers and Cable the clone. He then blasts Cable in such a way that Stryfe "awakens" in Cable's body, the first time it's made clear that Stryfes mind is sharing Cable's body (Stryfe proceeds to bemoan the fact that Cable shaved the beard, establishing the idea that when we saw Cable with a beard earlier in the series, he was either Stryfe, or had just resumed control following an extended period in which Stryfe was in control). A more talkative-than-usual Zero is at Tolliver/Tyler's side this issue, and while Nicieza has done a less-than-effective job at making this clear across the various series he writes, this Zero is both the previously-mute one who was constantly at Stryfe's side up until "X-Cutioner's Song" and the Zero who was the "prize" of Tolliver's will and got activated in Deadpool #4 (presumably, he was acquired and shut down by Tolliver after Stryfe died), the idea being that Stryfe altered his programming to keep him mute and shut down his primary directive (to server as an agent of peace), and then when he was activated by Deadpool, he reset to his default state. For whatever reason, in this issue, Nicieza plays coy about the fact that Apocalypse is the ruling force in Cable's future, even though previous issues of the series made that clear. Cable visits the grave of his mother, Madelyne Pryor-Summers, and it's always nice to see a reminder that character existed, but this issue also take pains to establish that Jean is a "spiritual" mother to him as well. Since its inception, this series has been mostly aimless. The first couple issues dealt with getting Cable back from the future, the next, a fleeting Six Pack reunion. 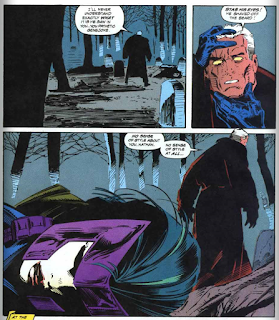 Last issue wrote out Sinsear, ending the closest thing the series had to an ongoing plotline running through every issue (leaving only the tease of who Sinsear was targeting remaining). 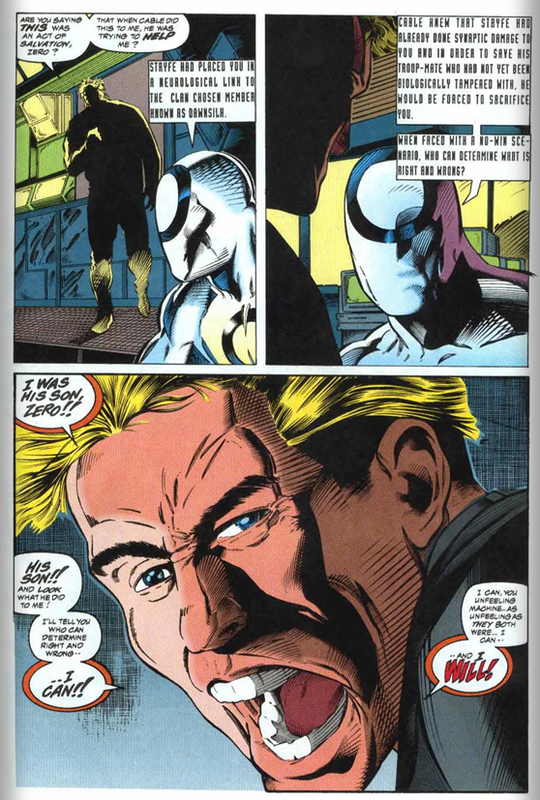 Through it all, the series failed to establish any kind of artistic vision, with three different pencilers and a bevy of inkers handling five issues. The artistic revolving door won't be changing for a while yet, and so with this issue Nicieza tries a different approach to give the title, if not a specific vision or purpose, at least some narrative relevance: paying off some long-simmering subplots about Cable that predate the series while resolving some of the biggest mysteries that have surrounded the character nearly since his beginning. However, this particular issue, the first part of three part story, is still mostly setup for all that. The big revelation here is that Tolliver is Cable's son, Tyler. While both characters (particularly Tolliver) have been hanging around the margins of Cable for awhile, nobody really cares all that much about them, so tying them together and in the process revealing a secret identity for Tolliver and the continued survival of Cable's son isn't exactly enough to put the book on the narrative map on its own. 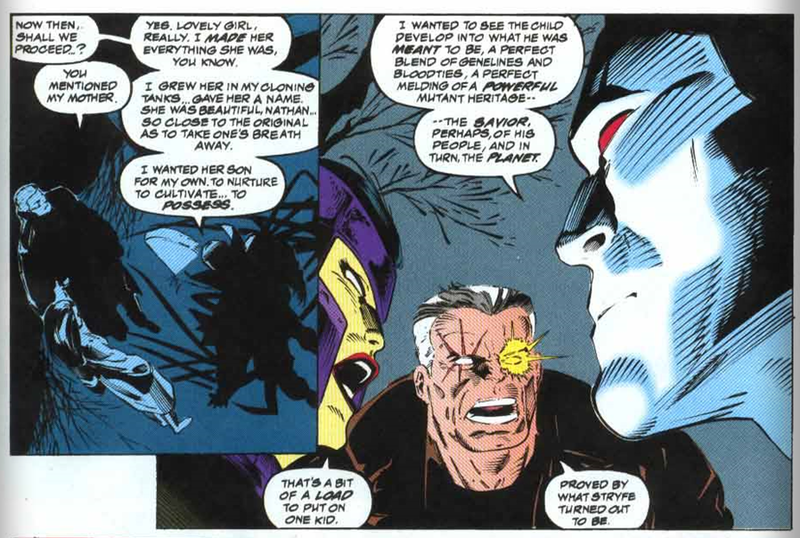 But it does lay the groundwork for bigger revelations: Cable's discussion with the typically-cryptic Mr. Sinister gets us thinking back to his origins, the return of (an) Askani gets in mind the events that led to the loss of Cyclop's son, presumed at this point to still be Stryfe, and Stryfe himself makes a return of sorts, establishing that he's been sharing Cable's body for the duration of the series (which also helps the previous five issues feel less disconnected from all this). Bigger reveals and confirmations regarding the character lay ahead in this story, and it will still be some time before the book itself establishes a non-commercial reason for being, but this is still the first issue of this series to feel like its doing something significant with its title character, instead of just meandering aimlessly from plot point to plot point. Next week: X-Men #27, X-Force #29 and Excalibur #72. The Summers men all have to sacrifice their kids. Either they throw them out of a plane, send them 2000 years into the future, or leave them behind on a battlefield. But they also have a knack for rather choosing to play the adventurous life of space pirate leader, superhero group leader or rebel leader than stay hanging around with their sons. Technically, it was mommy who threw Scott and Alex out of a plane, no? Yeah, that's true. Corsair was in the pilot's seat. Okay so I just watched a trailer. I remeber how little traction this story got at the time. From the moment Wizard started the whole "Cable is Nathan Christopher" hype, it was the biggest thing in comics, to the point that issues of Uncanny 201 were selling for around $60 at one point, a high sum in 1992, and close to the same price as New Mutants 87. 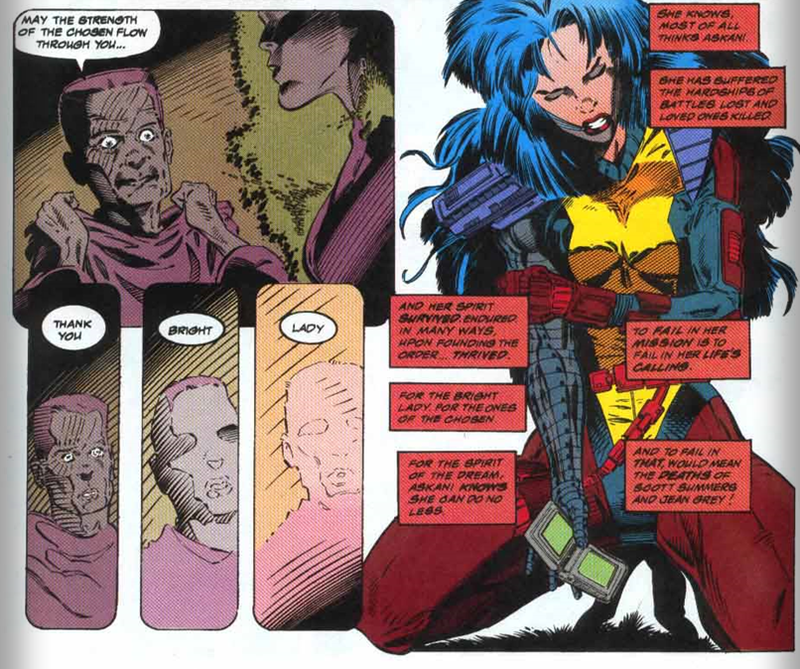 The lead-up to X-Cutioners Song was huge, with the promise of Cable's identity finally being revealed. When that story ened with a fairly vague payoff, that whole subplot lost steam almost overnight. 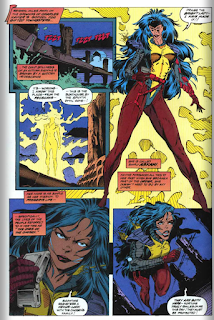 I always suspected that Nicieza intended to have X-Cutioner's Song wrap up the Cable origin, but Harris demanded the hazy ending in an attempt to milk it a little longer. After the shaky start to the Cable ongoing, he finally got the ok to let the cat out of the bag.